Camera Sliders are simple tools for adding dramatic motion to a shot, much like a camera dolly tracking move. No need for a heavy dolly and gear or addtional crew members. The camera "slides" along a fixed rail for a smooth and "repeatable" shot. The camera operator simply pushes the camera along the rail at the desired speed. Some models do feature a hand crank or a motorized feature. Sliders can be used by just one person and are easy to setup and move on location. Available in multiple lengths and capacities. DSLR Sliders are lightweight and affordable, designed to create a simple tracking shot with a DSLR camera. Perfect for improving a product shot or adding action to a scene. Larger camera sliders can handle the heaviest film production cameras. Sliders are extremely flexible in that they can be mounted down low on the ground or high up on a ladder. 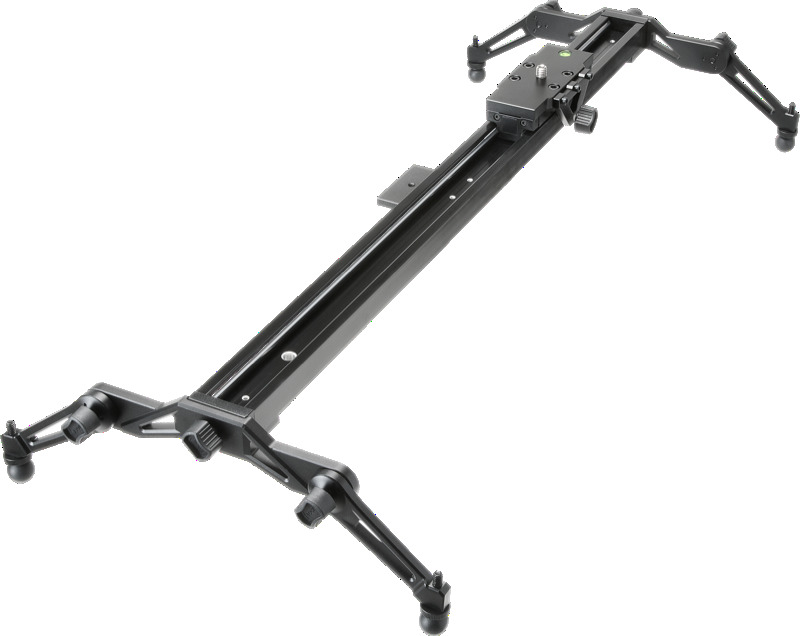 Easily mounted on tripods, apple boxes or rolling combo stands for just the right camera angle. Similar to a slider is a Dana Dolly, which is not fixed to a rail, but can use speedrail aluminum pipes for it's track. The advantage of speedrail is the ability to change the length of the pipe and therefore the length of the camera movement. Want to increase the production value of your next shoot? Add a camera slider to your equipment package.